Will his campaign endorse Hillary Clinton and minimise the risk of Trump becoming president, or will it back Green Party candidate Jill Stein and try to create a progressive alternative? Bernie Sanders. Cliff Owen/AP/Press Association Images. All rights reserved.Now it’s confirmed, Hillary Clinton will be the candidate for the Democratic Party at the American presidential elections scheduled in November of this year. After her win in the primary in California, she has obtained the majority of the delegates and ensured her nomination. Bernie Sanders has achieved results far beyond anyone’s expectations: he has built a campaign entirely financed by small donations around the themes of social justice and democratic accountability, usually essentially absent in mainstream American politics, challenged the financial and media establishment of the country, and successfully mobilised millions of people, especially among the youth. Sanders has brought a breath of fresh air into the oligarchic American political system, and has achieved an impressive result, considering the conditions of the contest. For these reasons, Bernie Sanders can also without doubt be considered the winner of these primaries. At this point, however, two very important questions are becoming pressing. The first is whether Bernie Sanders will endorse Hillary Clinton for the presidential election against Donald Trump, the Republican candidate. The second regards how to turn the momentum and the energy of Bernie’s campaign into a more durable and resilient movement. Bernie Sanders has already made clear in recent months that he will do everything in his power to make sure that the next American president will not be a Republican, which we now know would be Donald Trump. Bernie Sanders has also suggested, a couple of months ago, that he is prepared to back Hillary Clinton in the case that she would be the nominee. However, Sanders has also stated that Clinton should convince “millions of people who right now do not believe in establishment politics and establishment economics” by adhering to some of his proposals, notably a universal healthcare system, and that “Clinton is going to have to explain to millions of young people and a lot of other people that climate change is a real crisis”. That was in April, when the race was still alive. At this point, however, it is very likely that the Vermont senator will endorse Clinton sooner or later, whether or not she will adopt his proposals. As pressure will mount on his shoulders with the threat of the election of Trump looming in the distance, Bernie will most likely officially back Hillary Clinton. 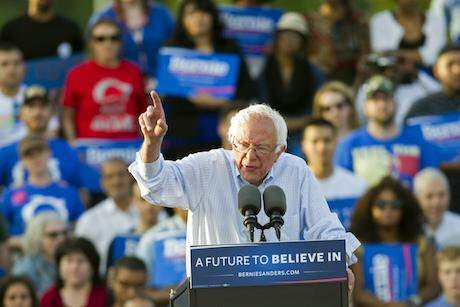 Sanders’ choice will therefore be purely pragmatic, to avoid Trump becoming president. However, if Sanders’ endorsement for Hillary Clinton appears to be the wisest choice, at this point, to avoid Trump being nominated as president, it risks having negative effects on the possibility of his campaign transforming into a lasting movement. In fact, Sanders’ endorsement could risk bringing disillusionment among some sectors of the movement, in particular the more revolutionary elements, which would regard an endorsement of Hillary Clinton as a betrayal of the radical spirit of Sanders’ campaign. The pragmatic and more reasonable option of endorsing Clinton to minimise the risks of Trump becoming president clashes, inevitably, with the energy and the radicalism of the movement behind Bernie Sanders. Some have proposed that Sanders support Jill Stein, the leader of the US’s Green Party, which shares a substantial number of Sanders’ proposals, and is even more radical than him in many respects. Such a move, however, would obviously drain a considerable number of votes from the Democratic Party, almost surely paving the way to the White House for Donald Trump. The chance to build a majoritarian movement around the Green Party in six months seems very unlikely. At the same time, many supporters of Bernie’s campaign, and myself, would be enthusiastic to see a third, strong independent candidate such as Jill Stein running for the White House, defying Hillary Clinton and Trump. The dilemma is a crucial one; the stakes are high, and the chances are slim. The challenge appears to be how to reconcile the pragmatic move of endorsing Hillary Clinton and, at the same time, transforming the vitality and the progressive nature of Bernie Sanders’ huge mobilisation into a strong and resilient movement. The alternative option would be to join forces with Jill Stein’s Green Party, defy the odds, and support her campaign for the upcoming presidential elections. Only the next months will tell us what will happen. What is sure however, is that change is always possible; let’s hope Bernie Sanders’ movement will upset the odds again, whether the senator decides to back Hillary Clinton or support Jill Stein.